Do I need a sound card to use the Razer Tiamat 7.1? We advise that you have a 7.1 surround sound card installed on your system so you can experience the full true surround sound functionality of the Razer Tiamat 7.1. Please visit www.razerzone.com/tiamat/en/soundcards for a list of soundcards that will enable full 7.1 audio on the Razer Tiamat 7.1. If you have a 5.1 sound card or a non-surround sound sound card, the Tiamat 7.1 will function according to the sound card’s limitations. What sound cards are compatible with the Razer Tiamat 7.1? Please use a sound card that outputs 7.1 channels of independent audio. 5.1 sound cards may also be used, but you will be missing the two(2) side surround channels. Some cards may require cable adapters. ASUS Essence STX II 7.1 - 3.5mm to RCA jack convertor cables required. ASUS Xonar DSX - Able to fully utilize all audio jacks found on the Razer Tiamat 7.1. ASUS Strix RAID DLX - Able to fully utilize all audio jacks found on the Razer Tiamat 7.1. ASUS XONAR DG Headphone Amp & PCI 5.1 - Side Surround channels (gray jack) not supported. Features 5.1 channel surround sound. Creative Sound Blaster ZXR - Side Surround channels (gray jack) not supported. Features 5.1 channel surround sound. Creative Sound Blaster ZX - Side Surround channels (gray jack) not supported. Features 5.1 channel surround sound. For further details on hooking up your Razer Tiamat 7.1 please see: https://www.youtube.com/watch?v=-YTubozx3zs. Do the Razer Tiamat headsets have a microphone? 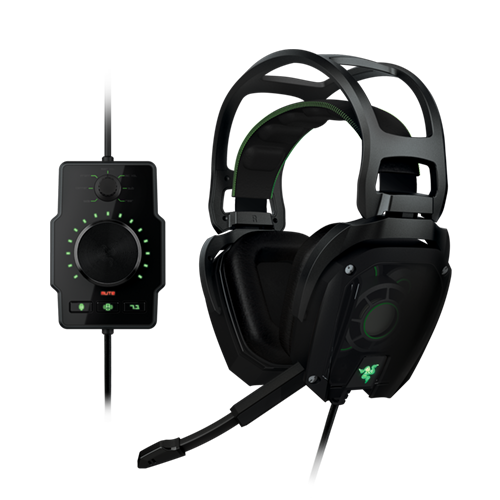 Yes both the Razer Tiamat 2.2 and Razer Tiamat 7.1 headsets have a fully retractable, unidirectional boom microphone attached to the left ear cup. How many drivers are in the Razer Tiamat headsets? The Razer Tiamat 7.1 is a true surround sound headset because it uses 5 drivers in each ear cup. This means it contains a total of 10 drivers to represent the 7 full range audio channels and 1 low frequency bass channel. How can I reduce the background noise received by the microphone? The Razer Tiamat 7.1 microphone is designed for maximum audio clarity. If you wish to reduce background noise received by the microphone, please activate the noise suppression option found under Windows Audio Settings. Please also make sure that Mic Boost in Microphone Properties is adjusted to an acceptable level. What are the feature differences between the Razer Tiamat 7.1 and the Razer Tiamat 2.2? Check this out www.razerzone.com/tiamat/en/features#compare for a detailed breakdown of the features in both these headsets. 5.1 surround sound consists of a center, left, right, side left surround, side right surround and the subwoofer channel. 7.1 surround sound consists of center, left, right, side left surround, side right surround, surround back left, surround back right, and the subwoofer channel. I can hear a slight buzzing or hissing sound through my Razer Tiamat 7.1 when not playing any audio. How can I solve this? The buzzing sound you are hearing is caused by the USB connection within computer systems that have a grounding issue and not due to the Razer Tiamat 7.1 headset. Some USB ports will cause this so we recommend switching the USB cable to a different USB port on your computer. If all your USB ports show the same buzzing sound, you may need to purchase an AC to USB converter (sold separately). On laptops, the buzzing sound may be slightly louder because of the way the USB ports are connected internally. Please note, if you turn up the volume of the Razer Tiamat 7.1 to higher levels and have no audio playing you may still hear some hissing. Unless it is abnormally loud and still audible when audio is played through the headset, this would be considered normal and you will notice this sound when using any high quality analog headset that is capable of reproducing these higher frequencies. Is the Razer Tiamat headset analog or digital? Razer Tiamat 7.1 is an analog headset that can connect to sound sources via a standard 3.5mm plug. To get the best surround sound experience with your Razer Tiamat 7.1, be sure to have a 7.1 capable soundcard installed in your system. The Razer Tiamat 7.1 has five 3.5 mm plugs for the following channels: Front (green), Center/Subwoofer (Orange), Side Surround (Grey), Rear Surround (Black), and Microphone (pink). What does true 7.1 surround sound mean? True surround sound is achieved when a sound system or headphones has an individual discrete/physical driver for each audio channel to give you a surround soundstage that's produced literally around your head. This differs from virtual surround sound which only has 2 drivers max and uses sound processing technology like Dolby Headphone to reproduce a sensation of surround sound. What kind of ear cushions do the Razer Tiamat headsets use? The Razer Tiamat headsets are designed with circumaural leatherette ear cushions for maximum comfort. It also has a memory foam that conforms perfectly to your ears for a snug fit. What type of drivers are in the Razer Tiamat headsets? The Razer Tiamat 7.1 (per ear cup) is compised of 1) a full range 40mm drivers with neodymium magnets and a Titanium coated diaphragm for bass; and 2) a full range 30mm drivers with neodymium magnets for front and center. Where do I download the software drivers for my new Razer Tiamat? The Razer Tiamat headset is an analog headset and does not require software drivers of any kind. The USB plug on the Razer Tiamat 7.1 version is solely used to power the control assembly. Why is the pinpoint positional surround sound important for gaming? Audio is a crucial factor for getting total immersion and enjoyment in the games you play. It is also absolutely necessary for giving you the competitive advantage as you'll know how to react when you hear exactly where flashpoints enemies are.